Brint Ryan, Chairman of the UNT System Board of Regents and a UNT alumnus and his wife Amanda have pledged to donate $30 million — the largest single monetary gift to UNT in school history — to the College of Business, which will subsequently be renamed the G. Brint Ryan College of Business, pending board approval. The announcement was made by UNT President Neal Smatresk in a ceremony on Monday in the Business Leadership Building. The Board of Regents will vote on whether or not to approve the name change next week. Ryan, accompanied by his family, delivered a speech at the ceremony. 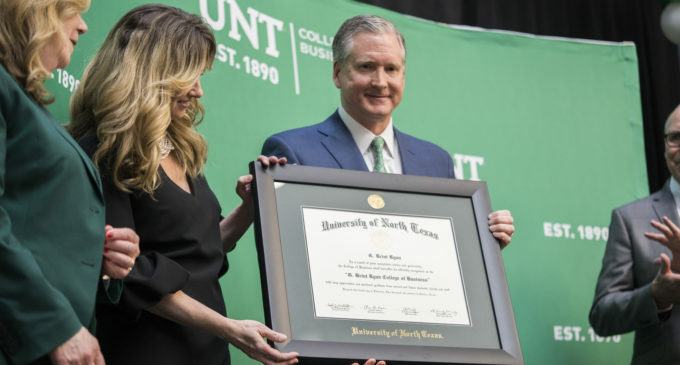 UNT alumnus G. Brint Ryan talks to the community on Monday, Feb. 4, 2019 about his reasons for donating $30 million to the College of Business, which will be renamed after him. Image by Trevon McWilliams. Ryan and his wife pledged the donation last December, but began planning their investment two years prior. He said they hope the funds will attract competitive recruits and instructors to UNT’s business programs. A UNT press release and an email from David Wolf, vice president for University Advancement, offered an outline of where the new funds will end up, beginning with $12 million going toward the appointment of new endowed positions. Ryan graduated from then North Texas State University in 1988. In 1991, Ryan founded and now serves as CEO for Ryan LLC, a tax consulting firm that is valued at around $1.1 billion as of 2018, according to the company’s website. Research endowments for several areas like taxation, finance and behavioral accounting as well as other programs and scholarships will see an $18 million increase in funding. Entrepreneurship senior Sarah Ponce offered her own ideas on where the donation funds should go. Other students praised the addition of Ryan’s name to the college’s title, including marketing senior Blake Ball. Ryan shared a bit of advice for students wishing to follow in the CEO’s footsteps. Featured Image: UNT’s G. Brint Ryan receives a certificate from President Neal Smatresk after giving a record-breaking $30 million donation to the College of Business. Image by: Trevon McWilliams.